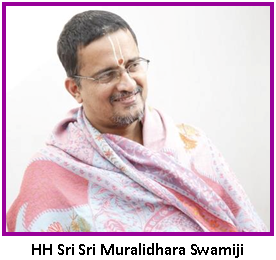 Categories: Faith, Grace of God, Guru, Sri Muralidhara Swamiji, Sri Sri Muralidhara Swamiji. This series chronicles interesting experiences recounted by the devotees of His Holiness Maharanyam Sri Sri Muralidhara Swamiji. These articles are republished from the series, “Madhuramaana Mahaneeyar” published every month in Madhuramurali monthly magazine. The original article was written by Dr. Bhagyanathanji, Personal Secretary of Sri Swamiji. In every devotee’s life and in particular for those who are blessed to be in satsang and follow Guru Maharaj, the most unforgettable moment would be the first time they were attracted to Guru or satsang. This would be a very cherished memory for them. The first experience of the couple, Sri Jagannathan and Smt Vidya from Singapore Namadwaar also is quite unique. They never thought of being in satsang or coming to the divine abode of a Guru until then. Jagan had been suffering from severe leg pain and had been receiving medical treatment for long. He was working for a bank in Singapore. He has two lovely children, Thushar and Krithika. Once, he had gone for treatment to a place in Serangoon Road, near Sri Srinivasa Perumal temple in Singapore. A young man was standing nearby with gopi chandan in his forehead and murmuring something. When Jagan approached him, he realized that the young man was chanting Nama. Jagan engaged in a conversation with him and learnt that the young man, Raghu is part of our Namadwaar organization. Raghu was holding a few flyers and when Jagan enquired about them, Raghu told him that Namadwaar is situated only in the first floor of that building and that Nama japa happens regularly and if interested, he can also participate. Jagan and Vidya went upstairs to Namadwaar and were pleasantly surprised. There was a divine portrait of our Guru Maharaj. They were spellbound by the divine beauty of our lordships, Sri Premika Varadan and Madhuri Sakhi who reside there. They had already developed reverence and devotion towards Sri Swamiji after listening to His lectures on television and internet and had a yearning to have His darshan. Only at that time they came to know that Namadwaar had been established by the disciples of Sri Swamiji and that Mahamantra kirtan was happening continually there. This was their first step towards Sri Swamiji. Initially, the only issue tormenting Jagan was his leg pain and his only prayer was for his health to get better. Devotees at Namadwaar told him that chanting Nama would fulfil the prayers. As none of the treatments were working for him, he contemplated on this and decided to chant Nama. He started coming to Namadwaar regularly and started chanting Nama. Within a few weeks, his leg pain vanished completely. Although this may appear to be an ordinary thing, at that point in time, this was the first step for Jagan to get more involved in Namadwaar. And this paved the way for his next step of wanting to have darshan of Sri Swamiji. According to our Shastras and Mahans, even a small incident in our lives is said to be pre-determined. The most important incident in everyone’s life would be when they reach the holy feet of their Gurus. Although we are ignorant, the truth is that Guru knows about us and our lives. This can be seen in the lives of many Mahatmas. While eagerly waiting for the darshan of Guru Maharaj, Jagan and Vidya went through some unforgettable experiences. Once, Vidya had a beautiful dream in which she had the darshan of Guru Maharaj and he spoke to her smilingly and initiated her into Hare Rama Mahamantra. Vidya was very happy and shared this dream with Jagan. Similarly, Jagan also had a dream. He dreamt about going to Ashram in the early hours for Guru Maharaj’s darshan where he heard the verse, ‘kAtyAyani mahA mAye mahA yoginyadhIshwarI’ from Srimad Bhagavatam being recited by someone. After having the darshan of Guru Maharaj in their dreams, their eagerness and enthusiasm to have His darshan started to increase multifold. In the month of Dhanur, on the auspicious day of Guru Maharaj’s divine star, Swathi, Jagan and Vidya came to Madhurapuri ashram for His darshan. Special dhanur month pooja was happening then. Jagan heard someone recite the verse ‘kAtyAyani mahA mAye’ from Srimad Bhagavatam and saw a portrait of Sri Kaathyayani near the altar, exactly as he saw in his dream. Guru Maharaj called them both and spoke to them about a few things and initiated them into Mahamantra. Jagan and Vidya realised that their dreams came to be true and shared the incidents with us. They also realised that Guru Maharaj’s darshan was not due to their efforts. One other time, after darshan, when they were leaving, Sri Swamiji asked them where they were going. Jagan said that Vidya had an ortho problem due to weak bones and they were going to visit a few temples as a remedy, as advised by their astrologer. Sri Swamiji smiled and told them, “Bones will get weaker as one ages,” and took them to the temple of Sri Kalyana Srinivasa Perumal near Ashram. Pointing to the Lord, Sri Swamiji said, “We have our Perumal and Nama, and that itself is the complete remedy.” He also told them, “Don’t worry. Hold on to Nama. Whatever things we need, Nama will take care of each and every one of them.” This was such a great upadesa for Jagan and Vidya. Whenever an opportunity came up, Jagan and Vidya would fly down from Singapore to have Guru Maharaj’s darshan. They have shared several incidents and the interesting thing is that every time they come to Chennai, they would have a new experience. Once Jagan was waiting for a taxi to go to Singapore airport but was unable to find one, and time was running out. Jagan became anxious that he might not have Guru Maharaj’s darshan and prayed to Sri Swamiji for His darshan at any cost. Suddenly, a van that was going somewhere came near him and halted. The driver asked him where he wanted to go and picked him up from there and dropped him at the airport. When Jagan offered him money, he did not take it but told Jagan, “God is great. Give this money to someone who deserves it.” Jagan later said that he saw only Guru Maharaj there. Another time when travelling in a flight, a young passenger suddenly fainted. Although the airlines staff knew to give first aid, if further treatment was required, the flight would have to return to Singapore. Everyone were quite perplexed and anxious, but Jagan started to chant Nama praying for the boy to get better. Within a short time, the young boy woke up and everyone was relieved and happy. Jagan thought to himself that irrespective of whether the boy woke up due to first aid or his chanting, the unrefutable thing was that since coming to the hold of Guru Maharaj, only Nama chanting comes to mind in dire situations. What more mental strength was needed? Another time, Jagan had a problem at work. The bank in which Jagan was working was affected by the global financial crisis. Jagan came and told Sri Swamiji that someone was going to buy the bank. Sri Swamiji smiled and told him, “Why don’t you buy it yourself?” After he lost the bank job at Singapore, Jagan thought of returning to Chennai to find a better job and started taking efforts towards that. However, Sri Swamiji told him that a job was waiting for him at Singapore. In reality, at that time, there was no hope for him to get a job in Singapore but Guru Maharaj kept telling him that he had a job at Singapore. One day, Sri Swamiji mentioned the name of a bank and told him to try for a job there. When Jagan contacted the bank, one of his long-standing friends working there, accepted his application and he got employed in Singapore itself. 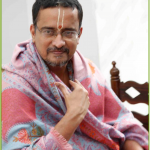 By Guru Maharaj’s blessings, Jagan, Vidya and their children continue to chant Nama and render their service to Sri Madhuri Sakhi and Sri Premika Varadan shrine at Singapore. They say that their life journey has become a path filled with flowers. Cherished Memoirs 65 – Know Faith, No Fate!